Tom Cruise’s celebrity continues to overshadow his work. From the outset of this production there appeared to be an effort as dedicated as the rebellion in this film to knock down this latest Cruise venture. First it was a German protest against allowing the couch-surfing Scientologist to film a German story in their country, then it was an over-the-top slag campaign after a test screening in the summer. The reteaming of Bryan Singer, Christopher McQuarrie and John Ottman, the three key collaborators behind “the Usual Suspects” back in a thriller genre they tore apart and re-invented 13 years ago should be receiving top billing in the headlines. The finished film, outside of any hype, is a decent film in the genre of Hollywood wartime thrillers. 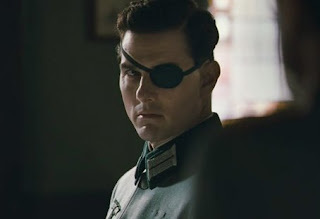 Tom Cruise plays Col Claus von Stauffenberg a German officer recently blown half to bits in Rommel’s desert campaign who desires to overthrow the Hitler regime to reclaim Germany’s honour. There happens to be a whole group of similar dissidents within the Nazi high ranks who feel the same. After a botched attempt by Kenneth Branagh’s Nazi character to blow up de Fuhrer he recruits Stauffenberg to command the team with a new plan of attack. Stauffenberg’s bold single-minded leadership is just the energy the group needs to get the job done. For Stauffenberg killing the man is only half the battle, overthrowing the government is the hardest part. The solution finds Stauffenberg when he hears his child play Wagner’s Valkyrie during an air-raid. Using sharp politicking and crafty progaganda techniques Stauffenberg plans to use an obscure Martial Law action plan called Operation Valkyrie to cease allow his secret SS group to cease control of the government. It’s a slow and uninspired set-up. McQuarrie skips over the hardest bit of writing by making no explanation as to how Stauffenberg gets recruited into the SS group. I always thought the most difficult aspect of a revolution is finding the like-minded individuals willing to stick their necks out for the cause. For good and bad McQuarrie quickly jumps this hurdle and directly into the scheming and plotting. The hallmarks of Bryan Singer’s talent as director lay dormant in this set-up. But once Stauffenberg is on board the second act is kicked off with the executed plan of action. Singer’s razor sharp pace, impeccable composition and shot selection suddenly jumps off the screen. As with “Usual Suspects” John Ottman’s unique skills as both editor and composer compliment Singer’s direction. Having an editor the same person as composer though extremely rare in filmmaking is in practise are natural roles to combine. Especially in the thriller genre where montage scenes rule. Singer and Ottman are careful to show the detailed machinations of the plotting, which replacing the lack of no action scenes, gunfights, or stunts. “Valkyrie” shouldn’t be watched for any kind of history lesson nor anyone looking for profound statements about the war, just another entry in the long history of Hollywood's exploitatioin of the war for disposable entertainment value. Enjoy. Stauffenberg wasn't recruited not an SS group...it was an army/civilian group opposed to the SS. And you final point that the film should not relied on as an accurate history lesson is unfair as the film as been given a pass on history by no other than resistance historian Peter Hoffmann, a very ahrd man to please. It is essentially a documentary of the bomb plot and it takes very few liberties with the truth. This may be its strongest point and should not be discounted.